Summer is in full swing and the sales of Bakersfield Real Estate is following suit. Here is the Bakersfield CA Real Estate Market Report – May 2018. As you’ll see in the report below we’re well underway with a busy real estate market! Closing out April 2018 with 1586 homes for sale we knew we were in the start of a busy season but May 2018 total homes for sale of 1609 certainly only further validated that. Something interesting that happened in our last months report was that total homes sold dipped from March 2018 with 681 to April 2018 with 621. May 2018 made up for the deficit though coming in at 740 homes sold which was a 19.2% increase. May was another great month for properties going under contract. April 2018 had 825 properties that went under contract and May came in at 971 which was a 17.7% increase. April to May’s days on market remained flat again for the second month at 41 with only a slight decrease from March 2018 of 42. As shown above it’s a great time to sell! Sellers are getting top dollar for properties and homes are selling with short days on market. It’s always important to remember that part of your success in selling a home is having the right partner. Your Realtor partner needs to be assertive, understanding, communicate well and have a proven track record. Luckily if you’re reading this then you’re in the right spot! Contact me for further details! If you’ve been thinking of selling your Bakersfield CA home then feel free to contact us anytime. We offer great service at competitive pricing. We aren’t the cheapest in town on Realtor commission but do you really want to go with the cheapest service? You’re selling a home so going to a discount agency for most feels like a cattle drive. Additionally with a hugely discounted rate comes discounted service. We take good care of our clients and make them feel like they’re #1. Take a moment to read some of our recent testimonials! We’ll provide you the seller the tools you need to make educated, informed decisions. Our valuations are always accurate and we’ll provide you with a sellers net sheet so you know exactly what you’ll walk away with at the sale. We bring many years and successful sales to the table as experience. Through the sale process you can rely on us as your trusted partner to properly guide you so you don’t make costly mistakes. As you can see our local Bakersfield CA real estate market is HOT HOT HOT! Bakersfield CA Real Estate Market Report – May 2018 shows no signs of cooling down anytime soon. Prices are also following suit as they’ve increased slightly over the past couple months. April 2018 sold average prices came in at $245,000 while May 2018 came in 2% higher at $250,000. Sold prices are also rising as we’ve crossed the $300k threshold. 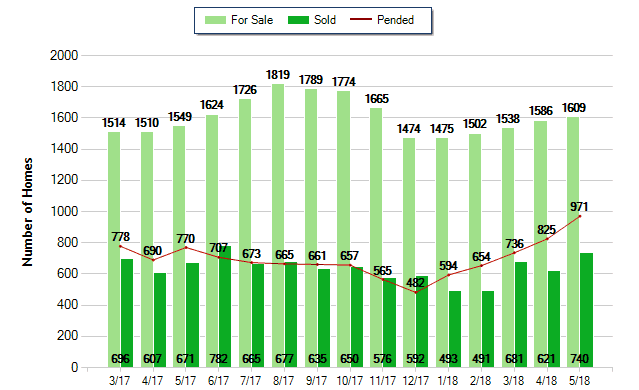 April 2018 came in at $299k while May 2018 sold pricing average was at $306k. Buyers looking to purchase a home in this market should act quickly or hold off till the end of the season. With no sign of slow down forecasted for the next several months buyers that need to find a home will want to find a home and make an offer fast. Buyers looking to get into a home during this busy season should anticipate multiple offer situations on homes while expecting to possibly pay over asking price. As you can see by the Bakersfield CA Real Estate Market Report – May 2018 the area shows signs of a fast moving market. If you have questions on buying or selling a home in Bakersfield CA, please feel free to contact us or leave a comment below.